This is a lovely product all the way from Shanghai, China that I had been dying to get my hands on. 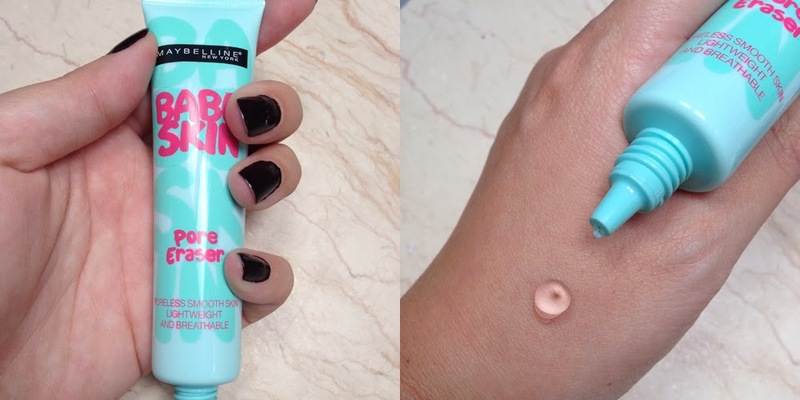 Maybelline has decided to respond to the crazy cult following of Baby Lips (I still don't get it) and to start churning out an entire Baby Line of makeup. Baby Skin is scheduled to release in the USA next year so I was thrilled to be able to get a little sneak peek of what this is all about. Baby Skin claims to be a great makeup base that is a lightweight and breathable formula with cherry extract promising a baby smooth and matte finish that moisturizes all day. This retailed for around 100 Chinese Yuan or roughly $17 which I think is fairly pricey and I expect a lower price when this finally comes to the US. This is comparable to the Benefit's POREfessional which retails for double of that. This comes in a squeezy tube and is clear gel, unlike the more fleshy tone of the POREfessional, that spread easily on the skin. Odor free which is also a plus and after testing this out for a few weeks does not appear to break me out. This does a great job minimizing pores and smoothing out my skin, wearing all day long and when matched up against the POREfessional, did great holding up. You can see the comparison above, this is just the product straight on my skin without another foundation over it, where they look pretty much the same amount of coverage/filling up. Obviously this close up my pores look ginormous either way but you do see subtle indications that the pores were smoother and prepped to apply something over it more evenly. While this product does do a fairly good job at staying matte all day, I do not like how it felt so oily on my skin. I feel like it does not deliver on the lightweight feel that it promises due to how it feels like it leaves an oily residue all day. I don't see a dramatic prolonging of my makeup, actually there doesn't seem to be much difference whether I use it or not, but it does do a lovely job filing out those pores. Also even though they suggest using it as a base, I actually think that placing it on top of a liquid foundation or BB cream achieves a better effect. I also like to counteract that oily feeling by applying it, then lightly blotting, following a light dusting of a translucent powder on top. I used my L'Oreal Magic Skin BB Cream, you can read a full review here, and you can see the drastic difference I found wearing it over compared to under. Final verdict, I would not pay $17 dollars for this again. If this was closer to the $10 mark I would be more inclined to repurchase. I have yet to find that 100% magical pore eraser that will just make them vanish. Have you found a great base yet for your pores?